Posted on January 21, 2016 at 4:27 pm. A friend of mine recently introduced me to the word and concept of hygge. Given the artic blast of cold that has descended upon us the last couple of days, I’ve found myself thinking quite a bit about this. Hygge is a Danish concept and, as described on the website www.visitdenmark.com, “Hygge means creating a warm atmosphere and enjoying the good things in life with good people. The warm glow of candlelight is hygge. Friends and family – that’s hygge too.” Pretty nice, huh? All of a sudden, the cold doesn’t feel that bad anymore, as images of sitting in front of the fireplace drinking some fabulous wine (and, of course, I’ll be eating chocolate too) with your sweetie and great friends create a feeling of warmth. I like it — I’ve always wanted to go to Denmark – and now I’m even more tempted! While we don’t have a fireplace here in the store (oh, but now wouldn’t it be so cool if we did), we do have wonderful candles from Graham + Kane. I love these candles – not just because they smell divine, but I so appreciate the attention to detail that has gone into every aspect of them. How fitting, in the spirit of hygge, that the candle line is called Peace, with each candle (No. One, No. Two and No. Three) having individual statements about peace. This is a picture of Peace Three – perhaps the guys at Graham + Kane have heard about hygge before. Posted on April 16, 2013 at 11:43 am. Can we all just agree that it’s about time that spring showed up? 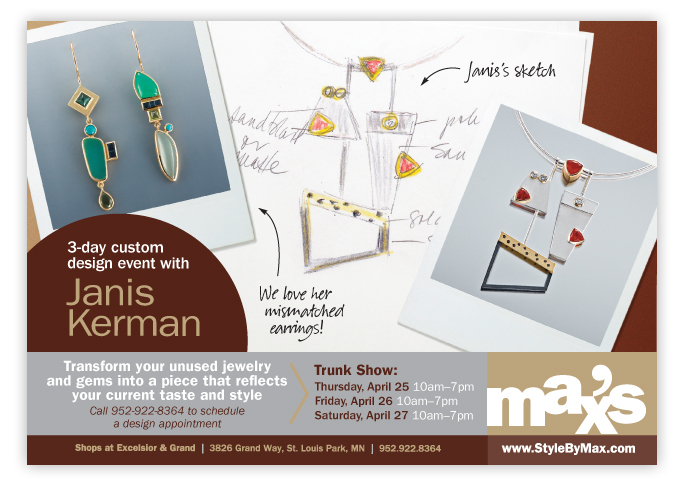 Spring is a great time for that “out with the old, in with the new” thing, so it only seems appropriate that it’s the time of year that we welcome jewelry designer Janis Kerman back to Max’s for a trunk show and custom design event. We will have quite a bit of Janis’ work in the store for you to purchase from the case, but she is best known for taking your “old” jewelry that you haven’t worn in years, and aren’t ever going to wear in the future and making it new and fabulous again with a custom design that fits your current style. Working with Janis is also a perfect opportunity for anybody who is interested in a custom designed engagement ring or wedding band. It’s easy to do – all that we ask is that you call the store to schedule a private design appointment so that we can be sure there’s enough time for Janis to create some sketches for you. The trunk show and design event run from Thursday, April 25 – Saturday, April 27.